To furnish the diverse requirements of our clients in the best possible manner we are involved in offering an extensive range of Flanging Machine. Forming Speed: 3m / min. 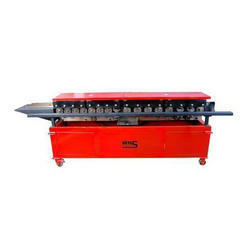 We are Designer and Manufacturer of Metal Forming Machine. - Double Seam Flanging Dies-2 Nos. - On One End Driven Through Hydraulic Power Packed Unit With Penal. - Automatic Start Stop Control Of Flang 16 Gauge Thick Sheet 7.5 HP Power pack. Being a leading firm in this industry, we are deeply engaged in offering a high-quality range of Bump Can Flanger Machine. Hand flangers are suitable for flanging ends of the can after reforming. Fabricated from quality raw material, these flangers are complete with adopter plate ideal for flanging round cans bodies of 301-700 diameter and 1-1/2, 10 heights. Sm Manufacturer & Trading Co. Heads flanging machines upto 50 mm thickness capacity with automatic flanging process. Head feeding and unloading systems. Hydraulic manipulators to mount / dismount the shaping rolls. Hydraulic presses upto 1000Tons pressing power for swelling, straightening and head dishing. Automatic manipulators to handle the blank during the automatic head dishing. We are one of the leading manufacturer and supplier of Dished End Flanging Machine. Manufactured using high grade raw materials and latest technology, these machines are available with us at market leading prices.